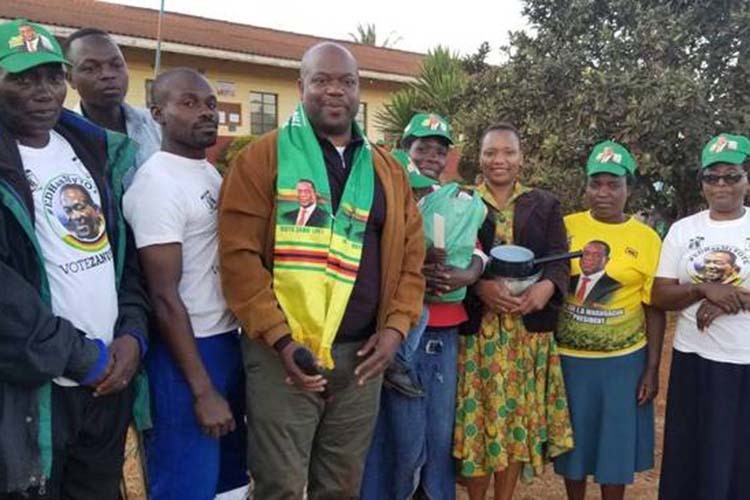 ZANU-PF aspiring candidate for Mutasa South constituency, Cde Misheck Mugadza, has brought back smiles to people in the area through a raft of community projects he is implementing which are aimed at uplifting the lives of many. His scope of community intervention is widespread and the effects are already being felt. Come July 30, Cde Mugadza is certain to win the elections with a wide-margin. His campaigns have been colourful, drawing large crowds that are reminiscent of street carnivals. 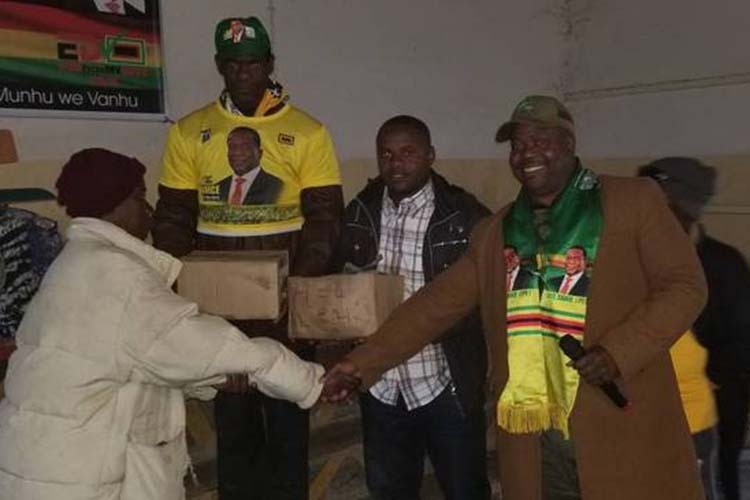 Cde Mugadza hands over groceries and clothing to a senior citizen as part of his community projects to assist the elderly and the crippled. From building classroom blocks, donating school furniture to several schools in the constituency, helping the crippled and the elderly, kick-starting poultry projects, free medical treatment to the poor, scholarships, free legal services and harnessing abundant water for small scale irrigations, the veteran lawyer said he feels indebted to help change the face of the constituency. Cde Mugadza said he has more to do to transform the constituency into a greenbelt, reiterating that the projects would go into overdrive after the elections. “We want results on the ground to ensure that communities benefit from the projects we embark on. People want food on their tables. They don’t eat promises. They want tangible things, promises that are fulfilled. This is my time to prove myself and plough back to the community that has been my home for decades. “By voting for me on July 30, the people of Mutasa South would have put the constituency in capable hands. I will represent them to the best of their expectations, give them constant feedback and listen to their views so that the constituency moves rapidly to achieve exponential growth rate. With President Mnangagwa at the helm and our councillors pulling the strings in municipalities the pieces to the development puzzle will be complete,” he said. Cde Mugadza has been running a number of programmes to assist people in the constituency. One of the major programmes that is helping people immensely is the healthcare programme. Doctors in Mutare through their committee approached him and offered to assist the sick people in his constituency who cannot afford medical bills. They are being treated for free. Hundreds have found this initiative helpful in the interim. “However, we later realised that after people get treatment they still need medication. So we opened an account with a pharmacy in town and the affected patients will just go there with a prescription and they access medication free of charge. We have well wishers and donors that are helping us to run that account. That facility has been running since April last year and it’s still on. People also access dental care from a local dentist. We are very happy that many people have benefited from this programme,” he said. Being a well established lawyer with two law firms in Mutare and Harare that have made big names in the legal fraternity, Cde Mugadza ploughed back to Mutasa South by offering free legal services. “Our law firm has been in existence for the past 35 years and last year when we were celebrating that anniversary, we sat and asked ourselves how best can we plough back to the community we are operating in. We then chose one of us to represent all the disadvantaged members from this constituency; those who cannot afford legal fees. Many have received help at the courts free of charge as part of our initiative to plough back to this community,” he said. Cde Mugadza is convinced that Mutasa South constituency has the capacity to be a green belt with emphasis on horticulture. “I believe that the abundant water we have in this constituency is a game changer. We have several water bodies such a Mutare River with lots and lots of water. We want this place to be the green belt and become the bread basket of the country. At my farm which is at Toronto, I have put up a dam and I am in the process of setting up 5 hectares under drip irrigation. We are going to use that farm as a training centre for horticulture. Here at my workplace, we have a hatching machine that hatches eggs up to 2 500 units. We have been assisting our community members by allowing them to bring in their eggs. They hatch and they take their chicks for free. That project is going on very well and its one of those projects that are uplifting the lives of many. We intent to import more of those machines and ensure that we empower our households. Each ward must have its own hatching machine,” he said.